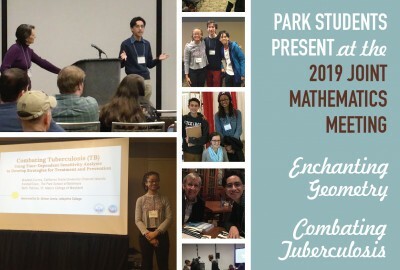 Two Park School students presented at the 2019 Joint Mathematics Meeting – the largest mathematics meeting in the world — held this year at the Baltimore Convention Center, January 16-19. Park senior Ollie Thakar presented on Friday with Upper School math teacher Dr. Katherine Socha on "Enchanting Geometry." Ollie was the only high school presenter in the session. Park senior Kendall Clark presented on Saturday with a research group from her summer study program at St. Mary's College of Maryland. Kendall was the only high school student in the program of 12 at St. Mary's. As a sophomore, Kendall received a Templeton-Ramanujan Prize for Scholarly Development. Abstract: Combating tuberculosis: using time-dependent sensitivity analysis to develop strategies for treatment and prevention. Preliminary report. Although many organizations throughout the world have worked tirelessly to control tuberculosis (TB) epidemics, no country has yet been able to eradicate the disease completely. In this talk, we present two compartmental models representing the spread of a TB epidemic throughout a population. The first is a general TB model; the second is an adaptation for regions in which HIV is prevalent, accounting for the effects of TB/HIV co-infection. Using active subspaces, we conduct time-dependent sensitivity analysis on both models to explore the significance of certain parameters with respect to the spread of TB. We use the results of this sensitivity analysis to determine the most effective strategies for treatment and prevention throughout the epidemic.